Posted by Jon in MOTUC, Review, Super7 with 0 comments. Fun toys are fun! 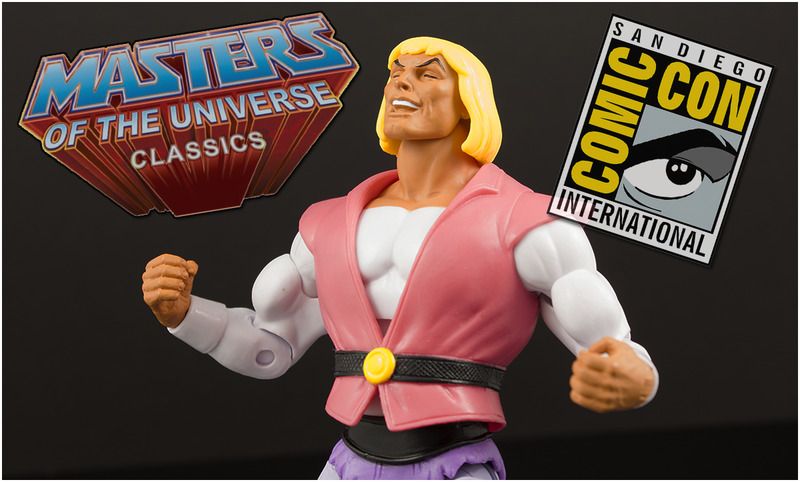 Which is why laughing Prince Adam is a fairly perfect idea for a San Diego Comic Convention exclusive action figure. For those unaware, about eight years back the Masters of the Universe Filmation show was mixed with a 4 Non Blondes “What’s Up” dance mix and a meme was born. Rumor has it that this was actually the planned SDCC exclusive for the year that Mattel handed over Masters of the Universe to Super7. Why it didn’t happen (if it really was supposed to) is anyone’s guess. From an action figure standpoint, he’s about what you should expect from the Masters of the Universe Classics ‘Club Grayskull’ aka the Filmation series. He has all of the expected joints, in addition the wrists include the inner hinge and the ankles have those clean looking rockers. The paint on mine is fairly clean. There is some stripping along he wrist joints, but otherwise he looks to be in good shape! Being able to pop the head off of a MOTUC figure is a time-honored tradition, but sadly I don’t think his head comes off. Mind you, I didn’t push it to the limit because I don’t really feel like breaking my new toy. If I’m wrong about this, please let me know! While I’d love it if I could pop off the head, I’m not entirely sure that the skin-tone would match any other He-Man figures in my collection anyway. The box style is the same used with the other ‘Club Grayskull’ figures but with a sparkly background. Sadly, he does not include a non-laughing head. (It was mentioned in a Pixel Dan interview with Super7 that they want to do a regular Filmation Prince Adam) The sword included appears to be the ‘Classics’ version molded in a clear pink plastic. I’m not sure why they went with that instead of the Filmation sword, but in all honesty it isn’t a huge deal to me. Unlike the first Prince Adam figure in the ‘Classics’ line, this one does have the loop on his back to store his Power Sword. I’ve been to Toy Fair and I’ve seen things. If there truly is a market for plush rainbow poop emojis, then there is most definitely a place for laughing Prince Adam. This particular figure was a great choice for an exclusive because it’s fun, but in reality it isn’t all that essential. Super7 did it right as well, offering the figure at the convention as well as a made-to-order preorder period for fans who either couldn’t make it to the show, or missed it while there. Those orders are expected to ship around October. Would I suggest Super7’s Masters of the Universe Classics Filmation Laughing Prince Adam? Definitely! Being a MOTUC collector, naturally I was going to get him. But he’ll also take up one of the rare coveted spots on my desk! I have a soft spot for those unique expressive action figures, and sometimes memes (the DNA of the soul).